This week, Queenstown was named the best New Zealand destination in TripAdvisor’s Travellers’ Choice awards, surprising no one. Loved for its “staggering beauty and heart-pumping thrills,” Queenstown draws millions of visitors every year from here and abroad. This tourist favourite has so much to offer that it’s hard to know where to begin. So we’ve pulled together some of our favourite things to do in the city, whether you’re out for adventure or a relaxing escape. Enjoy a taste of the region at Little Blackwood with one of their famous artisan cheese and meat boards, featuring Gibbston Valley cheeses, Zamora meats, Otago honeycomb and much more. With live music, a roaring fire and a wide selection of beers, wines and cocktails, it’s the perfect spot to graze and sip while you take in the magnificence of Lake Wakatipu. Nestled in the majestic mountains high above the picturesque Shotover River, Nugget Point Hotel’s Makoha Spa provides the ultimate place for relaxation and rejuvenation. Invest in some quality “we time” and step into a private room at the full day spa with your significant other for a couple’s full body massage. You’ll enjoy 60 minutes of bliss with breathtaking views. Sure, you can zip down the Kawarau River in a jet boat – or you can take the rapids head on with Serious Fun Riverboarding. You’ll travel 7km on a body board, tackling grade two and three rapids, riding whirl pools and eddy lines, and surfing river waves. You can even take on some underwater currents if you’re game. Then, after some epic rock jumping, you get to do it all over again. Boasting more than 18 tonnes of crystal clear architecture, you can’t beat Minus 5° ICE BAR for a seriously cool night out. Absolutely everything is made from ice – the walls, the bar, the sofas, the intricately hand carved ice sculptures … even one of their vodka-based cocktails is served in a glass made from ice. So grab a delicious drink, kick back on the ice furniture and chill for the night in sub zero temperatures. Show the world what you’re all about with ink from the famous Zealand Tattoos studio, established by prodigy tattoo artist Zane Swanston. While they specialise in Maori, Oriental and Ornamental designs, their award-winning artists cover every style and technique. They’ll tailor a striking piece of art to suit your specific requirements and tastes, and get it done with the highest standards of professional care. Go on, live a little. 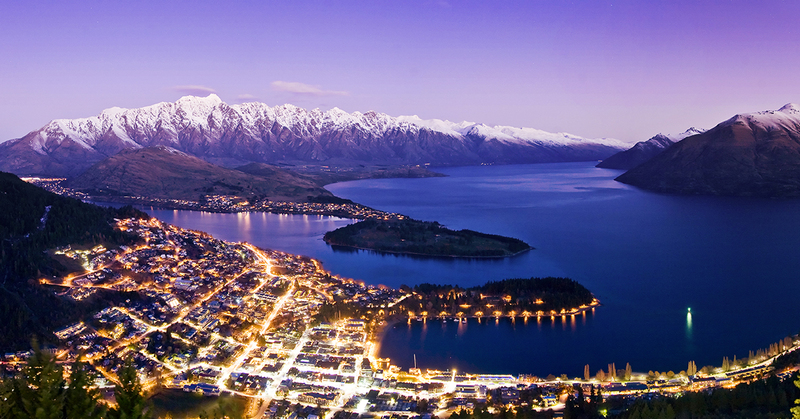 There’s plenty more to eat, see and do in Queenstown, so get out there! Because exploring our country costs less than you think on GrabOne.